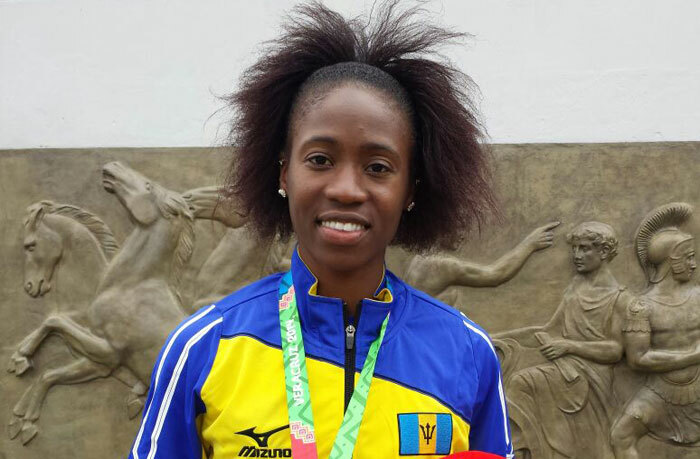 Team Barbados Rio 2016: Kierre Beckles (100m Hurdles) – Barbados Olympic Association Inc.
Kierre Beckles has been involved in Track and Field from the tender age of 7 having been encouraged by her brother Julien Beckles and sister Natasha Burkett-Sealy. Kierre is the current Barbados record holder in the 100m Hurdles event with a time of 12.88. In her first year attending CARIFTA in 2004, Kierre won a bronze medal winner in the 300m Hurdles. That same year in Mexico at the CAC Juniors she won silver in the same event. At the 2007 World Youth Championships in the Czech Republic she was a semi-finalist in the 100m Hurdles. Kierre’s role models are Gail Devers, Alwyn Babb and Diana Wilson. Her favourite color is blue. Kierre relaxes by listening to Soca, Afro beats, House and Dancehall. Her favourite music artist is local entertainer Edwin Yearwood. The best movie she has watched to date is the Lion King.